This morning, we performed dentistry on a 10 year old Rat Terrier. I just love showing off our dental surprises. Clinically, there is not much evident or alarming in this image. 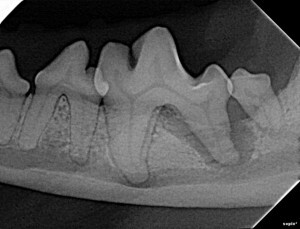 The following was the startling radiograph of the same tooth. With this new information, the veterinarian was able to make an informed decision as to the best way to proceed. Today was this dog’s lucky day. 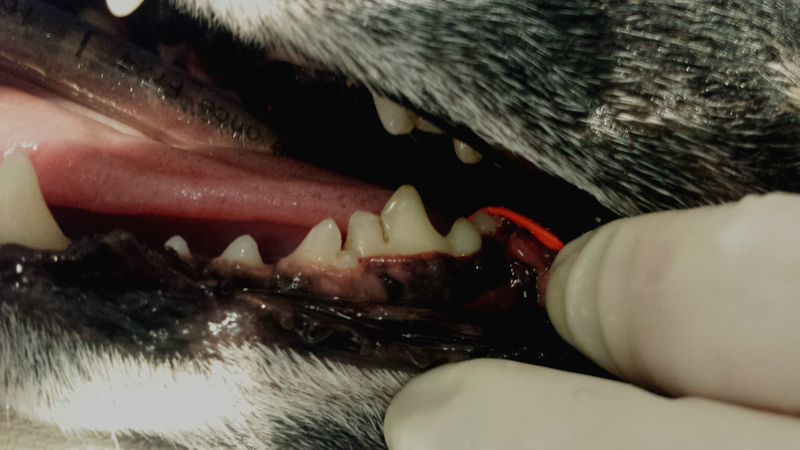 Despite the fact that initially this owner felt that there was nothing wrong, with proper education they gifted this dog with the extraction of the lower first and second molars. I expect that this pet will be acting like a puppy again within days. If you are working in a small animal practice or own a small animal practice and do not yet have intraoral radiology capability, feel free to contact me if you would like to consider adding such a valuable service. It is hard for me to contain my enthusiasm for the benefits of this single piece of medical equipment.